SO what is in those oatmeal breakfast bars? I put EVERYTHING you need to energize your day: ground flaxseed, wholegrain oats, carrots, banana and nuts. YEP! those are Vegan oatmeal breakfast bars, no eggs or dairy in this recipe. 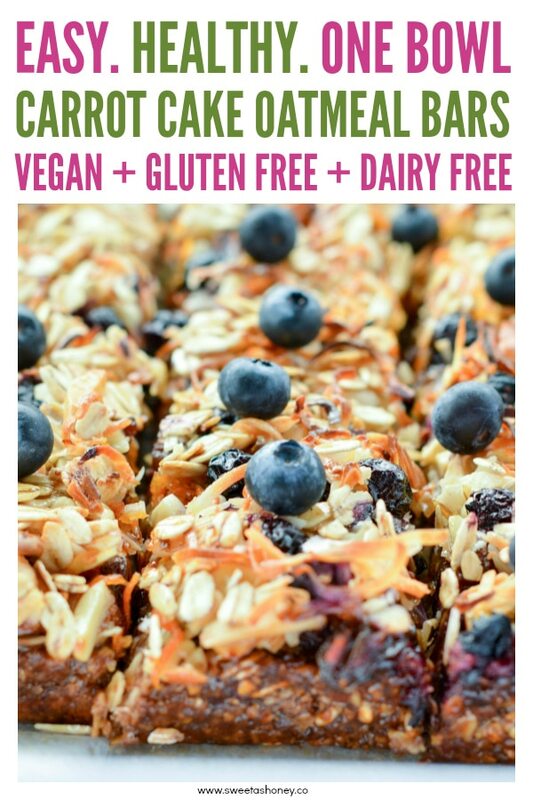 I made us a fiber and protein loaded bar with only natural goodness. YEAH! Let’s bring dessert for breakfast and indulge on those guilt free clean eating breakfast bars. Seriously, I can eat them ALL day not only for breakfast. After 3 years blogging full time you guys probably don’t realize how difficult it is to take nice shoot of food that you just want to eat lol Really, I ate 3 of those bars while taking those pictures! But you see I did not put on weight or feel sick – I mean my diabetes is in control even eating those bars – SO it definitely means it is good for you. 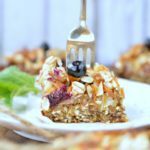 As I am a blueberries lover and it is the blueberry season in NZ, I added a bunch of fresh blueberries on top of those bar – a great antioxidant top up to those vegan breakfast deliciousness. NOW let’s talk about the texture of those bars. HELL YES, it is addictive! But it is rice malt syrup and it is not really sweet in taste compared to honey and it gets only 50 % fructose so it is less addictive too. Well, I need to find good excuses to overeat something, as always !!! SO now it is time for me to go, mother in law is around the house I have to be perfect and cook a nice dinner for tonight ! And if you want more healthy vegan breakfast inspiration, have a look at my oatmeal banana bread or vegan blueberry banana muffins. WATCH THE CARROT CAKE BAKED OATMEAL BREAKFAST BARS VIDEO RECIPE HERE! 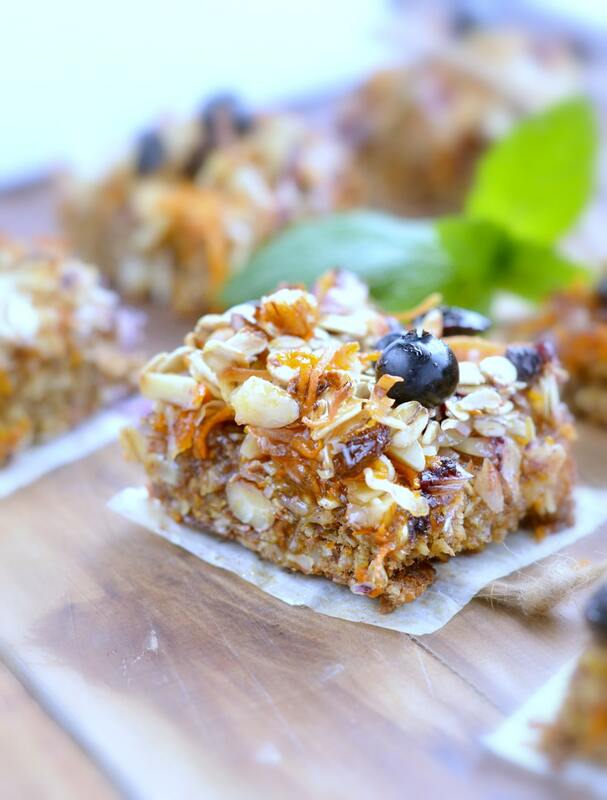 Healthy Oatmeal Breakfast Bars packed with carrots, banana, flax seeds and almonds. A delicious and easy blender recipe, 100% vegan to boost your protein for your busy mornings on the go. Preheat oven to 360F (180 C). Cover a square baking pan (8 inches * 8 inches) with baking paper. Set aside. 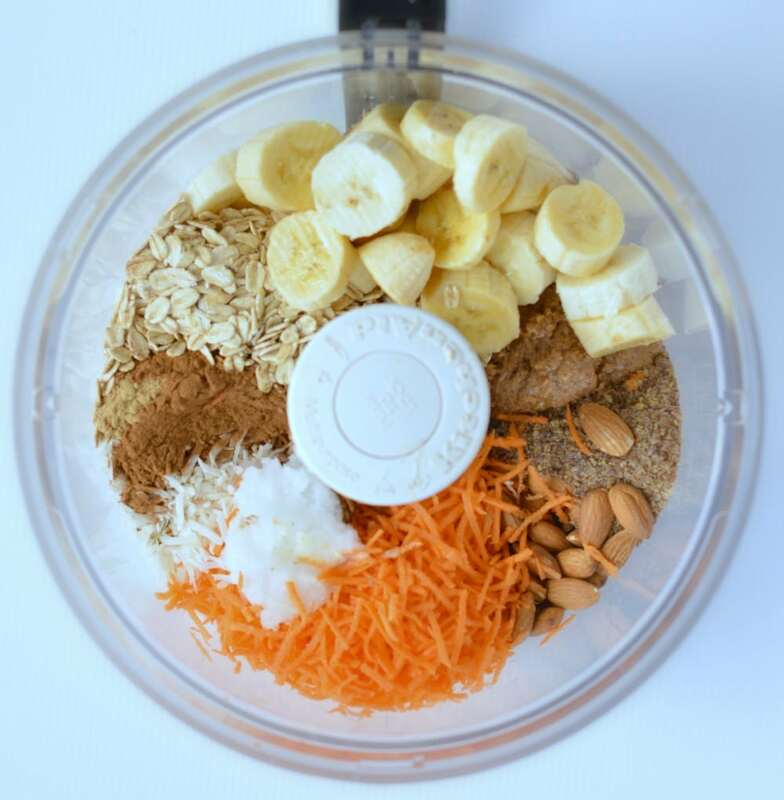 Using a food processor with the S blade attachment, add all the oatmeal bar ingredients except the grated carrots. It is preferable to melt the coconut oil before adding it to the bowl. Process until it comes together and all the oats and nuts are pulverised. It will form a sticky consistent batter and it should not take more than 1-2 minutes on medium speed. Stop the food processor often, scrap down the sides with a spatula and add the grated carrots. Process again 15-30 seconds to incorporate the grated carrot into the batter. Don't process to long to keep some texture from the grated carrots. Transfer the batter into the prepared square baking pan. Press firmly and evenly with your hands to cover all the bottom of the pan. Bake 15 minutes until the sides starts to gets crispy. Into a mixing bowl add the coconut oil, rice malt syrup and almond milk. Microwave until liquid - about 30 seconds to 1 minute on high. Combine in all the toppings ingredients into the melted mixture. Remove the pan from the oven using oven mitt. Spread the toppings on the top of the baked bar. Press firmly to stick to the pre-baked carrot cake bar. Sprinkle fresh blueberries (if used) and slightly press them on top. Return to the oven for 15 minutes or until the topping is crispy and golden. Fully cool down - 1 hour- into the pan before removing the bars from the pan. Cut into 16 squares. The topping will be a bit loss but you can add an extra drizzle of rice malt syrup or honey on top of the bars after baking to stick things together. Topping: the bar toppings add a lovely crunch to those bars. However it is optional. You can also make the bottom layer only and bake for 25/30 minutes. Storage: Store into a metallic box or cookie jar up to 1 week. Freezing: Can be frozen up to 1 month in individual zip plastic bags. I recommend to wrap each bars in a plastic bag and then place all the bars in a larger zip plastic bag. Defrost at room temperature the day before. Can be rewarm 5 minute in a warm oven to add some crunch. I feel like the oil in the topping is incorrect. The topping never got crunchy/crispy, the whole thing was dripping with oil. I even poured oil out of the pan and then put back in the oven to try crisping the top. I let it set on a wire rack to drain and then on a paper towel. Did I do something wrong? Hi Jessica, I am sorry to hear that. I used 4 tsp of coconut oil and I realized I have written tbsp in the recipe ingredient list on th blog 🙁 Hopefully I keep all my recipes on a paper notebook to double check! I am so sorry for this typing error that ended up in a bad baking experience. I very hope you managed to enjoy the base of this carrot cake bar anyway as it is a very tasty recipe. Thank you for your feedback, I updated the recipe and I hope to see you again on the blog. Thanks Jessica, Carine. How many cups of bananas does it require in this recipe? Hi, I don’t measure bananas in cups. This recipe will work well with any banana size. The only different will be the sweetness of the batter. However I used 2 banana, medium size, 100g (3.5ounces) for each banana without the skin. Enjoy this lovely recipe. Carine. But you should know that rice malt syrup is actually very high on the glycemic index. I’m not sure where you got your information, but it is incorrect. Hi Jillian, thanks for the complementary information. It is good to know. I simply noticed that my body react better to rice malt syrup compared to honey or agave or even maple syrup. It is probably because there is no fructose and only maltose in it. Thanks for adding those ressources ! Carine. Hi Jillian ,thank you very much for those extra information. I also though the GI of brown rice syrup was 25 ! Good to know that it is actually as high as other liquids sweeteners. I anyway I never use much Sweetener in my recipes and those carrot cake bars always works well for me ?I hope you will give it a try anyway! Thank you again, it is good to learun new things from my readers ! 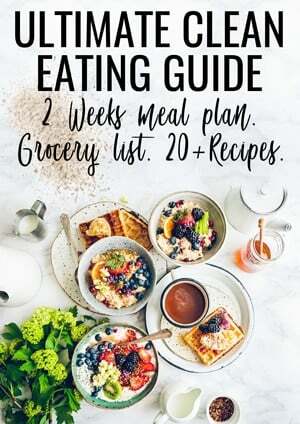 I am not a nutritionist simply a mum who try to share my passion of cooking healthier for my family and you are more than welcome to add useful input like this on the blog ! Thanks, Carine. Can you please tell how many calories, fat grams, carbs these bars have per serving? Thanks! Thanks for your message. I am not sharing nutrition panel for my recipes because I believe that calories don’t count. The quality of your calories is what makes a difference in how the food is nourishing and good for your body. 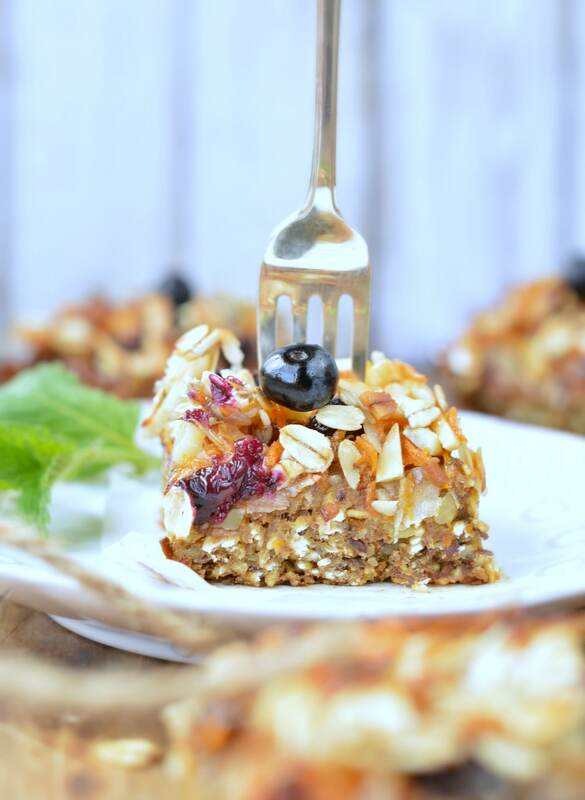 It this recipe I used only wholesome and natural ingredients like wholegrains oat, carrots, bananas, low carb sweetener like brown rice syrup which to me makes an healthy carrot cake bar compared to those made of white flour and loaded with sugar. I hope you will still try this recipe and understand my food philosophy! Trust me one slice of those bars are very fulfilling and you will love them. Enjoy the recipe. Carine. Hi Linda, No problem. You can see the nutritional panel just after the recipe box. This recipe makes 16 squares. The nutrition panel is for one square. Enjoy the recipe ! xoxo Carine. Hi! So glad to have found your recipe and am eager to try these bars. My toddler just ate 3 pre-packaged baked oatmeal bars for breakfast and I thought, “I must find an alternative to these that actually gives him some nutrition– not just sugar!” Heading to grocery now to get ingredients… Thank you for sharing! Hi Melissa! I am so glad you find me on the internet recipes ‘jungle’ lol My 3 years old love those bars so your little one should love them too. My recipes are lightly sweet so I sometimes noticed that kids that are used to ‘high sugar’ pre-packaged bars are more fussy to eat those one. You can try to use honey in this recipe to start with a highest sweet taste while keeping the whole thing nutritious and natural. Even, add an extra drizzle of honey on the bar first and then decrease until he get used to this new low sweet taste! Let me know how it works for him! I hope you will find all delicious recipes around here. See you soon on Sweetashoney. Carine. I never have nut butter in the house. Is there anything I can sub for the nut butter or can I just leave it out? Hi Em, That is too bad, almond butter contains lots of healthy fat and fibre plus it had a delicious taste to those bars! However you can simply substitute almond butter by unsalted butter, soft at room temperature, if you are not vegan. I hope it helps ! Carine. Hi Sarah, THANK YOU ! I hope you will love those carrot cake bars. As you said it is different to the industrial stuff we are used to eat. But it is natural, full of wholesome ingredients good for our body. It takes time to get used to those clean eating recipes. I love eating this way as I feel so much better, more energized and the taste is delicious to me. Thanks for taking a minute to write such a lovely comment. I hope it will encourage others reader to try this recipe. Enjoy the recipes on the blog! I have got lots of simple healthy breakfast option for you to try next time! xoxo Carine. You made my day Sarah! I am so happy to know that you both loves it and that the recipe worked perfectly. I love the idea of using different nut butter. This looks yummy, thanks for sharing your ideas and positive experiences! Carine. I will definitely have a look at more of your yummy healthy meals! I have genuinely never responded to the blog post of anything I”ve made before, mostly because I’m lazy but partly because often I don’t follow the recipe and feel the results are likely an unfair reflection of what you hoped for me to eat! haha! Anyway, I made these yesterday, and they were FREAKING AWESOME! The first comment was a little right about the oil, but I actually felt it was too much so didn’t add all of it in the first instance. Perhaps edit the blog post though! … ANYWAY. They were SO GOOD I took them to a class and they were all gone. Today I’m off to stay with some vegan friends and I threw a batch of these in the oven just now to take with us (no carrot left so subbed apple) .. this will go down as an all time fave and I can’t wait to try alternative fillings. I’m thinking pear and ginger would be nice, or perhaps a little dark chocolate for a nice treat! Thanks soooo much! I love them!!!! Hi Imogen! Thank you SO much for this positive feedback on that carrot cake oatmeal bar recipe ! I am so happy to know that it works well in any kitchen around the world and that people appreciate their taste. I never tried different fillings yet but I love the idea of using pear, ginger and chocolate! YUM! I will update the coconut oil amount for the topping as you are right some people may find it a bit too much. Thanks for reading the blog and sharing your experience in your kitchen testing my recipes. 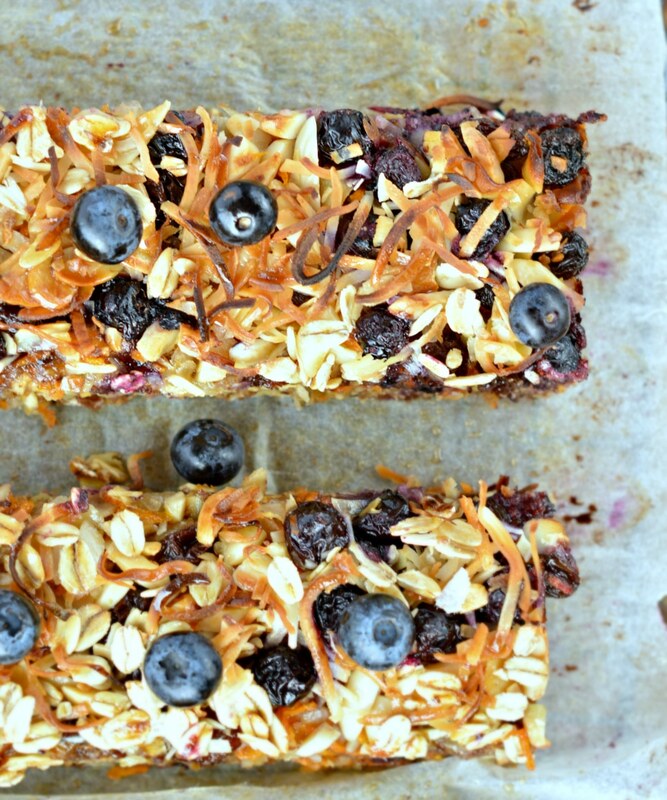 Such a pleasure to get inspired by you to for my next batch of those breakfast bars. See you soon on the blog. Carine. I don’t own a food processor. Can you tell me if I can still make these? Hi Cathy, unfortunately this carrot cake bar recipe required a food processor. The oat and banana has to be blended in a puree like texture to create a batter that hold after baking. I have got plenty of others breakfast oat recipes that don’t use a food processor. You can try my clean breakfast cookies here for example. Thanks for reading my blog and testing my recipes. See you soon on the blog, xoxo Carine. Could you substitute agave for the rice malt syrup? Hi Rebecca, Sure! you can actually use any liquid sweetener of your choice like honey, rice malt syrup, agave, maple syrup etc. Enjoy the oatmeal bars and thanks for trying my recipes ! xoxo Carine. Hi Nadia, I am pretty sure it will freeze well like any muffins or cookies. I never tried to freeze those carrot cake bars because it never last long in my house. Plus, it stores very well in the cookie jar ! Thanks for testing my recipes and reading the blog Nadia. See you soon here! xoxo Carine. When you add the coconut oil to the processor isn’t inteaded to be melted first ? Hi Stephanie, Both works well but I tend to prefer to melt the coconut oil too. It makes the batter easier to work. I will update the recipe card with this important detail. Thanks for spotting that Stephanie ! Enjoy the bars 🙂 Carine. Have you ever made the breakfast bars using only the bottom layer without the top layer? I wonder if they’d be just as yummy and similar to a granola bar. Of course you can make the bar without the topping. It will taste like a granola bar with a softer texture. Enjoy the recipe. xoxo Carine. I do not mind the oil but do not like the texture of coconut.If I leave it out should I add something else and if so what? Hi Paula, if you don’t like shredded coconut you can replace it by ground almonds – same amount. It will perfectly work in this recipe. Enjoy ! xoxo Carine. Do you think there is something to substitute in place of bananas? My almost two year old is very allergic, but would love to make these! Hi, I did not try the recipe without bananas so I would not recommend anything before trying. Apple sauce may be a good substitute. Let me know if you give it a try. xoxo Carine. Can I substitute something for the banana? Allergic to it. Hi, Maybe applesauce would work but I didn’t try the recipe with something else than banana puree so I won’t recommend a substitute at 100%. Enjoy! Carine. Great recupe. Turns out just great! Awesome ! So happy to hear that. Thanks for sharing. XOXO Carine. This looks so good! What a great breakfast meal prep for a family! I am so glad you enjoy it ! XOXO Carine. Yes very well ! the re is no eggs so you can easily keep those for a week in an airtight container in the pantry or fridge as you like. Enjoy the recipes on the blog, XOXO Carine.